Built by Car-Bus in Spain the design has been heavily adapted to include essential EVM design characteristics. Note the function steering wheel and the neat body system controls grouped to the left of the driver. 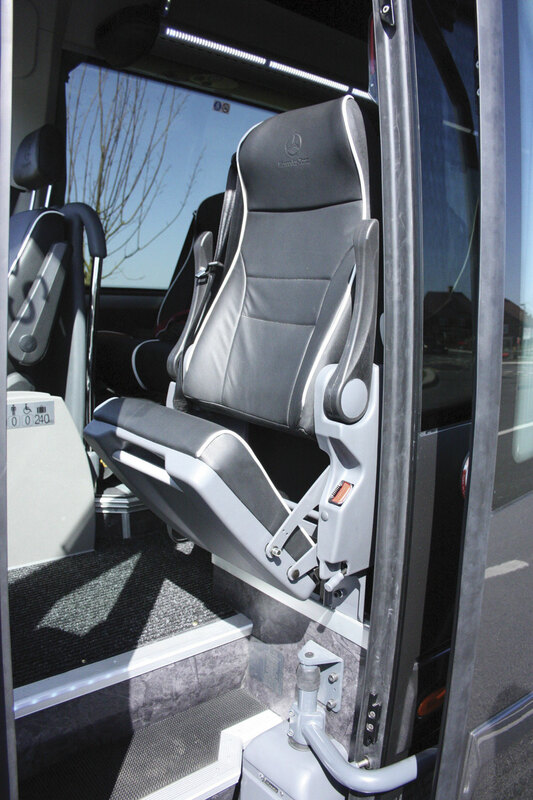 In the short time it has been in existence, EVM has carved a reputation for its innovative and well designed minibus and minicoach conversions of the Mercedes-Benz Sprinter van range; especially the five-tonne 513, 516 and 519 models. They are practical designs manufactured to a high quality standard. EVM are particularly well known for their high end luxury corporate vehicles, typified by their top of the range X’Clusive, but their line up is a broad one including popular all rounders like the up to 22-seat Classic, Elegance and Avantgarde. They also produce wheelchair accessible vehicles, either with conventional rear loading via a wheelchair lift, or their recently introduced Community low floor directly wheelchair accessible model. They have even produced minicoaches using the 4 x 4 Sprinter base. They build vehicles in both right and left hand drive form and have a growing presence in Europe. The EVM Grand Tourer is very stylish. Built by Car-Bus in Spain the design has been heavily adapted to include essential EVM design characteristics. Evidence of the EVM influence on the design is the front bumper spoiler unit which is pure EVM X’Clusive. A characteristic of all these vehicles is that they are manufactured by EVM itself at its large manufacturing facility at Kilbeggan in Ireland’s County Westmeath. That has changed with the company’s latest introduction, the Grand Tourer or GT for short. The GT is not a van conversion but a coachbuilt product and it isn’t actually manufactured by EVM itself. I asked EVM Sales Director Danny McGee why they had decided to go into the coachbuilt market and why they weren’t building the vehicle themselves. The motivating force that set EVM on this course did not actually come from within but from its loyal existing customer base. EVM has a lot of customers who undertake high end corporate work and though happy with the X’Clusive, were looking for a flagship vehicle for their fleets that provided increased internal space and allowed even more luxury and innovation. It was against these criteria that Danny McGee and the team began investigating possible partners. Their researches took them to minicoach builders all over Europe. Those researches finally homed in on a small Spanish builder not widely known outside of Spain. That company is Car-Bus based at Manresa near Barcelona. The company was started in 1980 by Angel Monferrer who had spent over 20 years in the coachbuilding industry before setting up his own company. He concentrated on building special vehicles like mobile libraries. 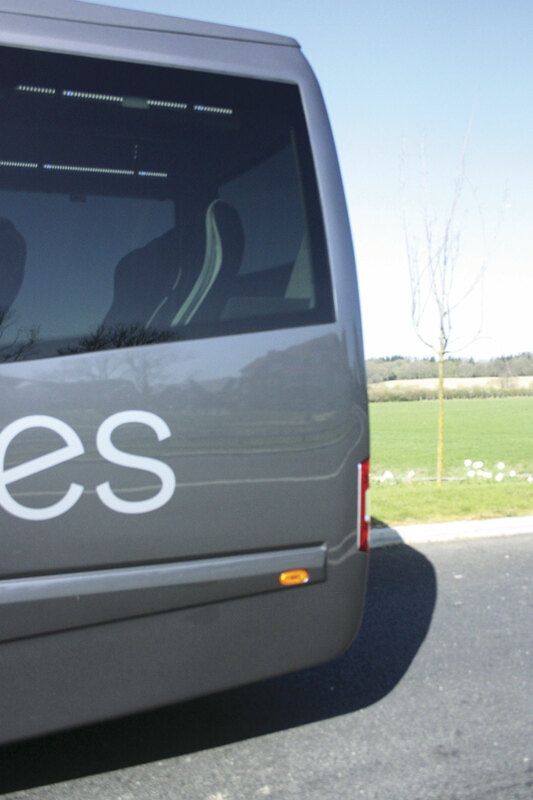 In 1990 he was joined by his younger brother Jordi and they began to move into producing minibuses and coaches in the main for other manufacturers, particularly Noge. That business continued to grow and in 1999 they moved into larger premises in Manresa. By now they were largely producing vehicles for Noge. The onset of the world financial crisis had a massive effect on Spain. Almost overnight the massive domestic market for minibuses which was largely controlled by local authorities and State controlled institutions disappeared. This had a huge impact on many of the large Spanish coachbuilders and some of them found themselves in severe difficulties. One of the most heavily affected was Noge which was unable to continue in its existing form. This had a serious affect on Car-Bus. In truth Noge had begun to experience problems even before the financial crash and Car-Bus had reacted to those warning signs and had begun to establish itself as an independent builder. As a result of that, the loss of the Noge business, whilst having a major effect on the company, did not bring it to its knees. They re-trenched and worked hard to establish their position as an independent builder of quality minibuses and coaches working largely for Spanish customers of which there were still some despite the financial situation. Along the way they developed a very stylish coachbuilt Sprinter based minicoach which they call the Spica. The Spica and Car-Bus were just what EVM was looking for. Of the Spica Danny McGee says, ‘It is well designed, well manufactured and has real style. 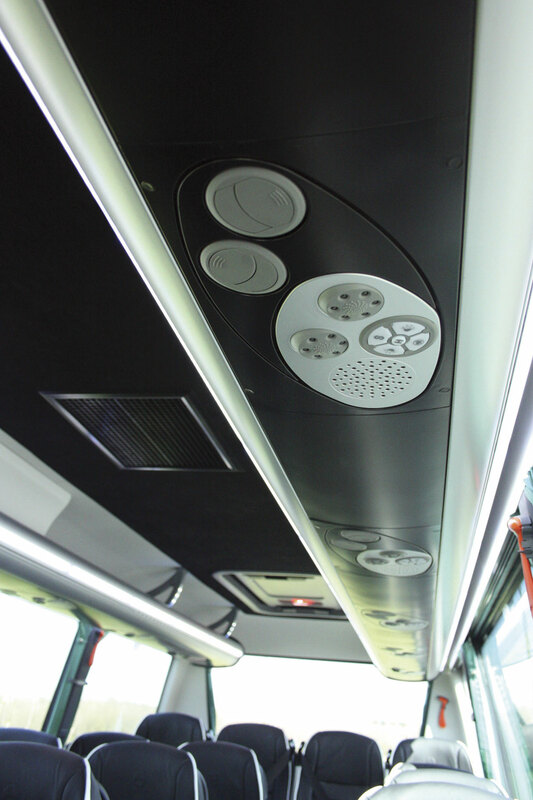 It didn’t meet our standards in some areas, particularly internal trim, equipment and systems, but we felt ‘EVMising’ the Spica would be relatively easy if Car-Bus were happy to work with us and they were. Over a period, the two organisations worked together to develop the product. A couple of prototypes were built and Danny knew they were on the right track when he showed it to some of his valued customers and they said, ‘it looks just like an EVM built product.’ A bit of further tweaking and the design, now called the EVM Grand Tourer, was ready to be launched onto the market. EVM have in fact launched the vehicle across all its markets, the UK, Ireland and Europe. 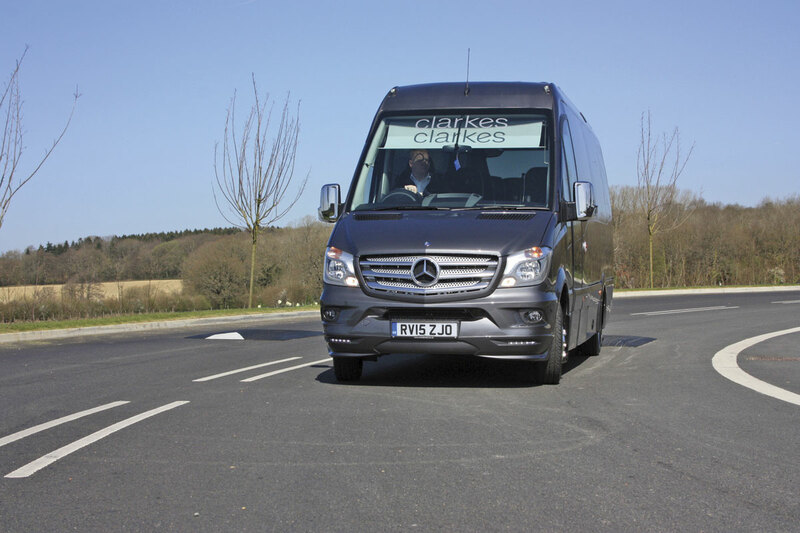 The basis of the Grand Tourer is the long wheelbase Mercedes-Benz Sprinter 516 or 519 chassis. The 516 is fitted with the four-cylinder turbocharged Mercedes-Benz diesel to Euro6 and developing 163bhp. The 519 is fitted with the Mercedes-Benz V6 turbocharged diesel which develops 190bhp. Both are supplied fitted with the acclaimed 7G Tronic-Plus seven-speed automatic transmission, although a manual option is available. Onto this base, Car-Bus mount a steel body structure built from heavily corrosion protected square tubing. That frame is clad in fibre glass mouldings, which are of an exceptionally high quality standard. The structure is packed with acoustic and thermal insulation, an area where EVM had an early influence. Another is the external styling where EVM’s trade mark front bumper spoiler with integrated fog lights and day time running lights, colour coded bumpers, side mouldings and chromed front grille, pure EVM X’Clusive, are incorporated. The Grand Tourer has an overall length of 7.74m, width of 2.05m and an overall height of 2.93m. A slightly longer 8.0m version is produced for Ireland to meet their complicated VAT laws. Entrance to the vehicle is via a wide entrance fitted with another standard EVM item, an electric plug door produced by Masats. There is a three-step entrance into the interior with good sized flat steps and well positioned handrails. The steps have removable rubber pads, stainless steel inserts and LED edge lighting. 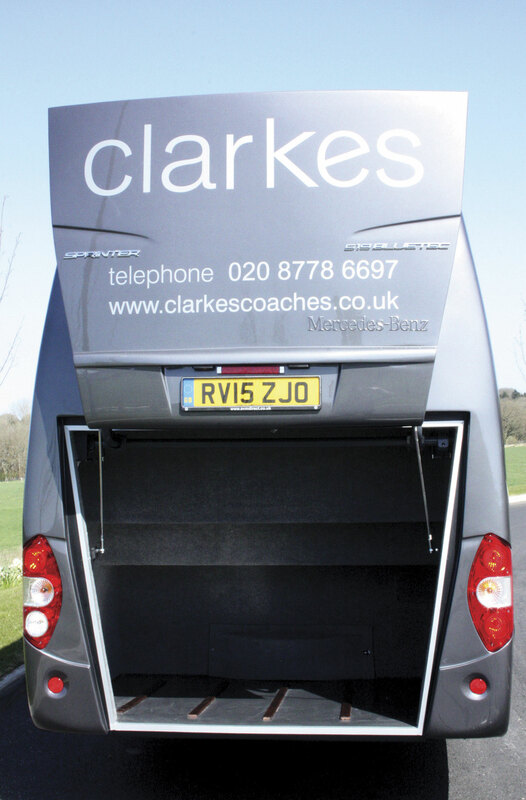 Once inside the vehicle has a completely flat floor with sunken gangway. 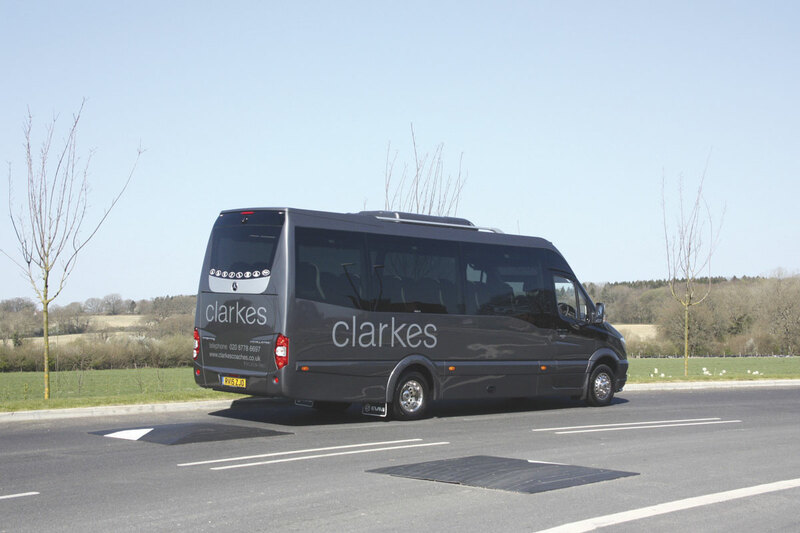 The standard specification is for the floor to be finished in wood effect Tarabus non-slip flooring but the example illustrating this article was fitted with a slate effect version of the flooring which was the customer’s optional choice. The central aisle is carpeted. The interior sides including the ceiling coves are trimmed in soft touch ABS mouldings. 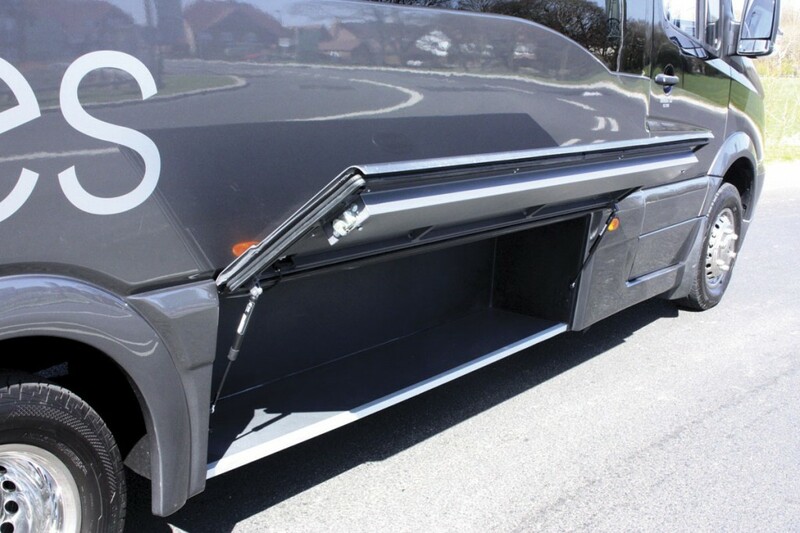 Both sides of the vehicle benefit from being fitted with full length, brushed extruded aluminium racks which incorporate full length enclosed lighting, blue LED night time lighting and individual passenger service units with integrated passenger reading lights and adjustable air vents. 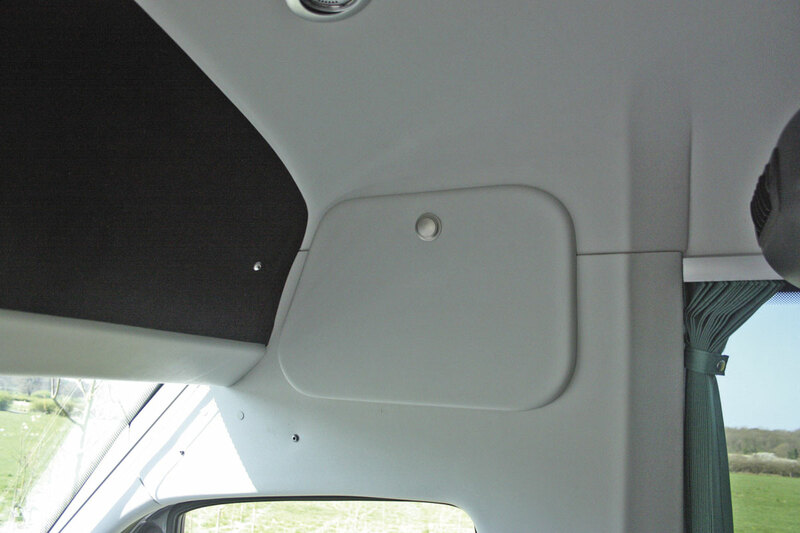 Above the driver’s seat there is a lockable storage unit recessed into the side panel. Glazing uses panoramic, bonded, double glazed units tinted in privacy grey. Cill cappings are in wood effect with a very nice satin finish and beneath the cill caps are concealed LED lights that give a soft wash down the panel sides. Full draw curtains with moulded tie-backs are standard. 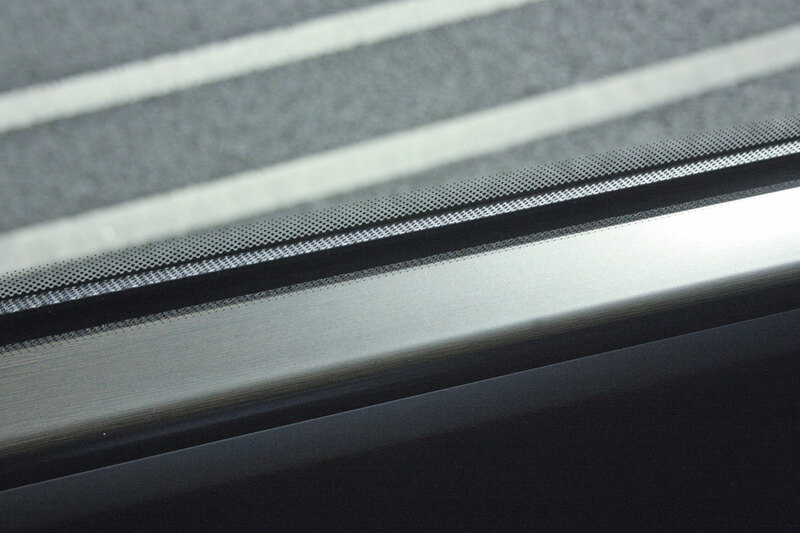 The front windscreen is a large panoramic unit which gives excellent, wide, forward vision. It is fitted with two individual roller blinds. As with all EVM products, PSV Glass are the appointed stock holders for replacement glazing. 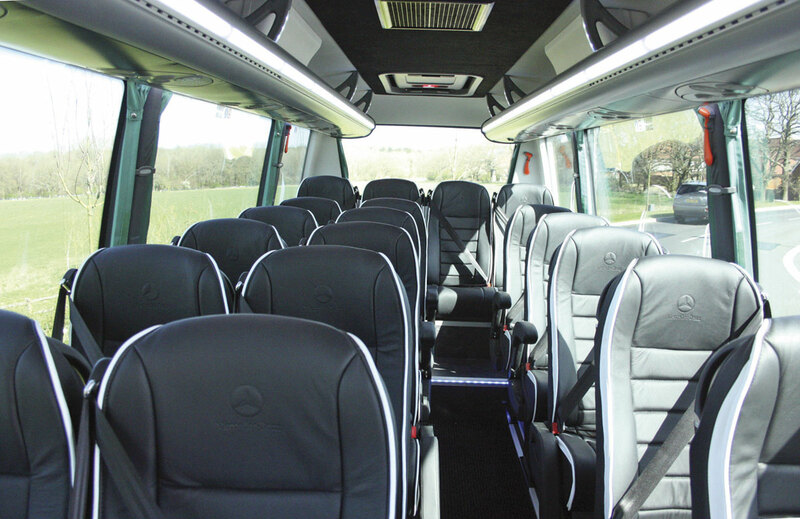 Seating in the saloon is for 19 passengers plus a courier making a total complement of 20. The seats are Brusa Executive 120 recliners with three-point belts and folding arm rests on the aisle side. 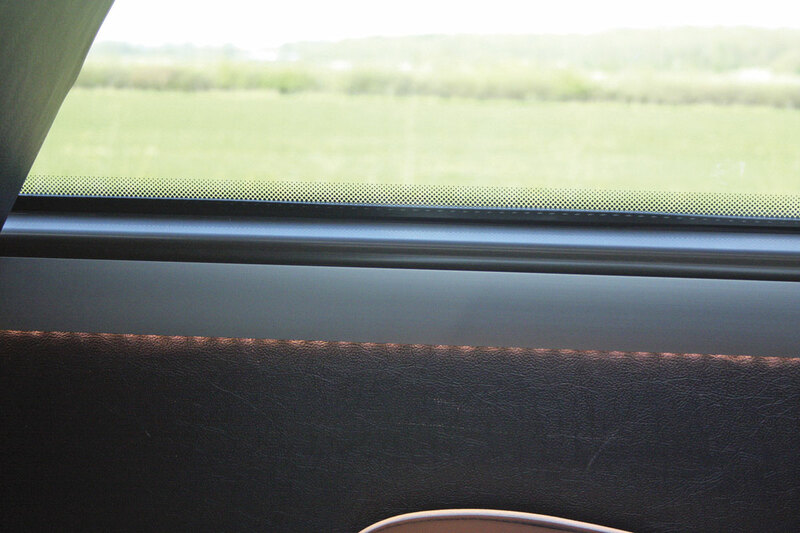 The seats incorporate additional soft foam and side flaps and they are trimmed in two tone real leather. The arm rests are also trimmed in leather. The courier seat is similarly trimmed and incorporates twin arm rests, a three-point seat belt and a fold up cushion. Heating and ventilation includes a glazed 970mm x 500mm roof hatch which also doubles as an emergency exit. The vehicle is fitted with a Mercedes-Benz H12 auxiliary water heater and thermostatically controlled convection heating which runs down both sides of the saloon. Air conditioning in the saloon is covered by a roof mounted Webasto Diavia Madrid 15.5Kw unit ducted through the racks. An extensive audio visual system is provided. The standard principle unit is a Mercedes-Benz Audio 15 radio/SD system. Please note that the vehicle illustrating this article is actually fitted with an Audio 10 system but all future build will have the Audio 15 unit. One of the benefits of the Audio 15 system is that the reversing camera image is displayed on the Audio 15’s large touch screen. EVM also offers several multi media entertainment packages as an option to upgrade. 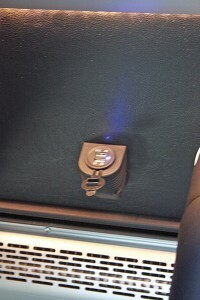 The on-board sound system is ducted through the vehicle system to the individual passenger speakers. 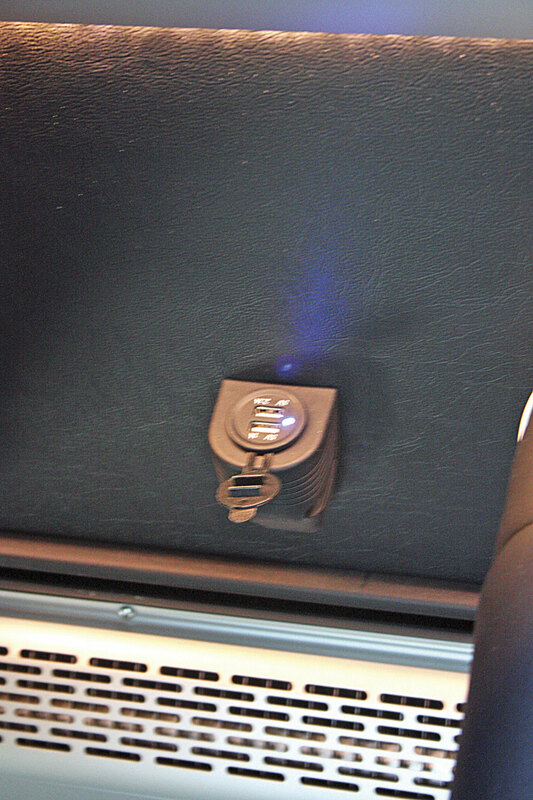 The driver has a hand held microphone clipped to the dash and there is also a socket and clip for the microphone adjacent to the courier seat. A DVD unit is mounted in the dash and there is a 17in fold up monitor recessed into the ceiling at the front of the vehicle. Also in the head lining is a digital clock/temperature unit. I have already mentioned the saloon lighting but in addition there is additional down lighting when the entrance door is open and the driver’s door also benefits from a down lighter. Outside the vehicle, apart from the EVM styling kit already mentioned, the coach is fitted with spacious side lockers on both sides. 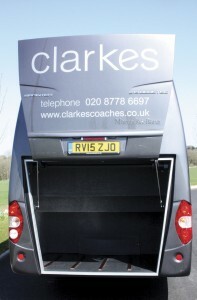 At the rear there is a parallel action powered door, operated from the cab, giving access to a spacious, drop-well, boot. A reversing camera is also fitted. The excellent basic cab of the Sprinter is retained. Note the function steering wheel and the neat body system controls grouped to the left of the driver. The audio unit in this example is an Audio 10 but all future production will be fitted with the new Audio 15 system. 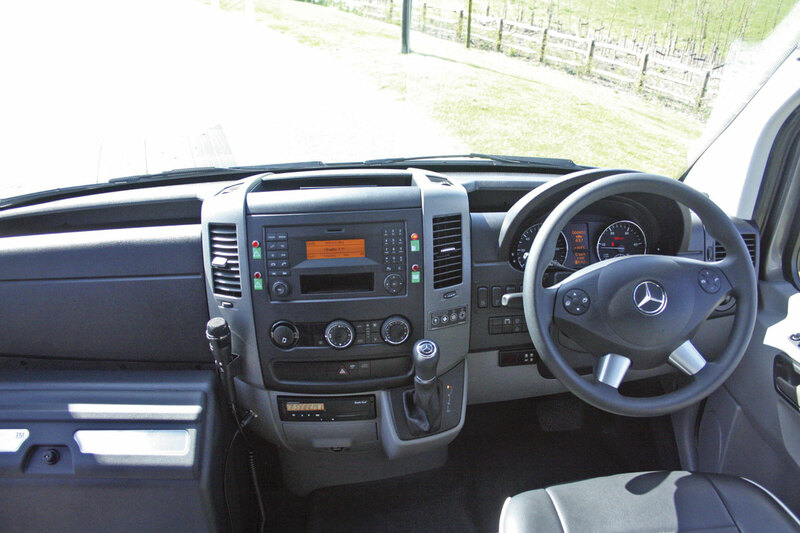 The cab of the Grand Tourer is predominantly standard Mercedes-Benz Sprinter and why would it not be because Mercedes-Benz set such a high standard with their cabs these days. The fully adjustable Comfort driver’s seat, complete with fold down arm rests, is trimmed to match the saloon seating. The body system controls are grouped together in a neat panel fitted to the dash on the driver’s left. The driver also benefits from a multi-function steering wheel, an internal mirror, Bluetooth connectivity and remote central locking. 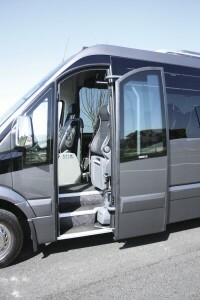 In addition, the Sprinter comes with the host of safety systems incorporated as standard by Mercedes-Benz. The driver also benefits from having his own air conditioning using the Mercedes-Benz HH9 Tempmatic in-dash system. 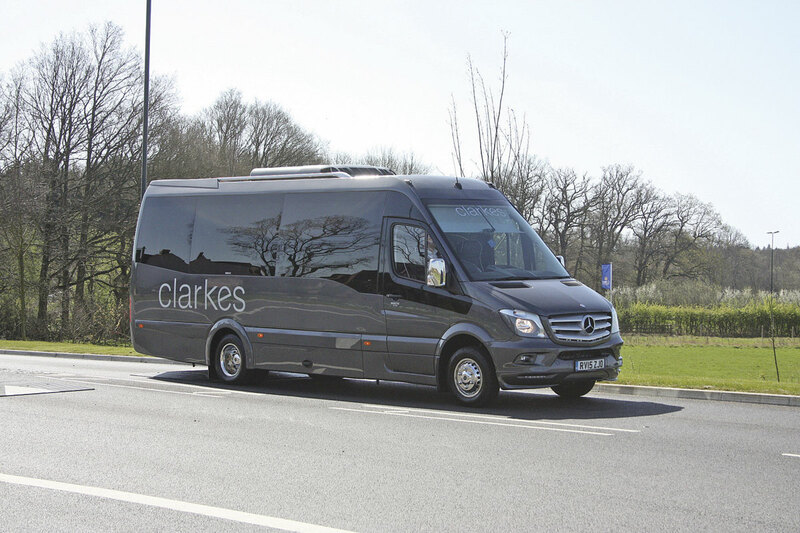 The specification includes digital tachograph, speed limiter and cruise control and there is also a large locker provided under the dash on the near side. Having such a high standard specification, the options list is small. It includes a TM fridge fitted in the locker at the front of the vehicle, saloon tables, a 220V inverter with three point sockets and USB charging ports at each seat. Two other options are Alcoa Durabite alloy wheels and a Telma retarder. The vehicle is built to European Whole Vehicle Type Approval. The mechanical side of the vehicle is covered by a Mercedes-Benz three-year unlimited mileage warranty which can be optionally extended to cover a fourth and fifth year. The body is covered by EVM’s Direct Warranty Agreement which lasts for two years from the date of delivery. 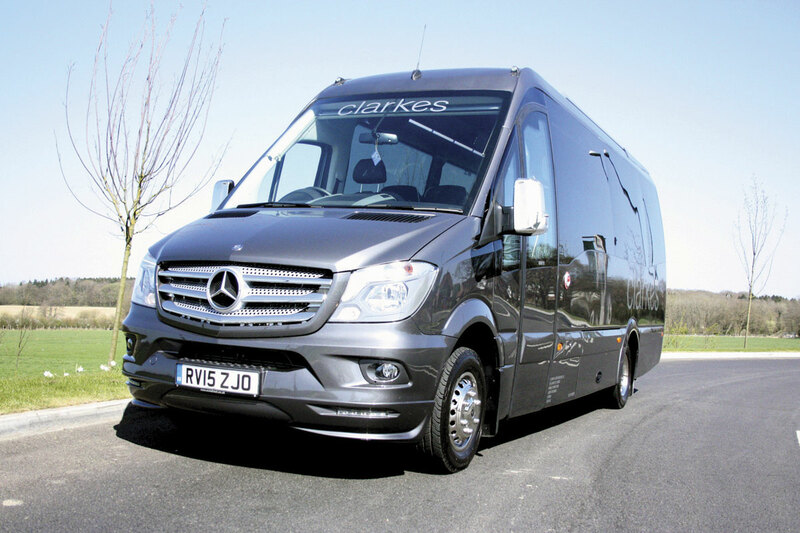 The vehicle is priced at around £86,000 excluding VAT depending on final specification. My first impression of the Grand Tourer was that it is a very stylish looking coach comfortably able to take that flagship role. I particularly like the styling of the rear end and the subtle curvatures that blend the rear into the sides. That feeling of opulence is continued once inside the vehicle. The standard of finish both externally and internally is exemplary. Everything fits together perfectly. 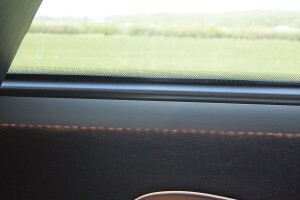 There are no gaps between trim panels to harbour dust. I’m not going to talk about the performance of the 516 Sprinter as I’ve covered that in previous articles on the latest Euro6 Sprinter. Suffice to say that the latest Sprinters are a dream to drive. They are powerful, quiet and economical. The 7G Tronic-Plus transmission gives smooth progression with barely noticeable ratio changes. The road holding is outstanding as is the steering and the braking. The excellent vision through the screen coupled with the superb rear view mirrors means that the driver’s vision around the vehicle is just about as good as it could be. But what’s it like to ride in? First of all one must comment on the seating. These really are very nice seats providing genuine comfort but with a good degree of support as well. The belts are easy to use, not something you can say for all belt systems, and they are comfortable to wear. The ride, both at speed and over rougher road services, is top quality. You can optionally, if you want to, have the vehicle fitted with Gliderite rear air suspension. Vision through the massive side windows is excellent and both the Webasto air conditioning and convection heating make it easy to keep the internal ambience at just the right level. I mentioned earlier that I was hugely impressed by the standard of fit and finish on this vehicle and that is borne out on the roads. There are no squeaks and there are no rattles, none of those nasty plastic on plastic rubbing noises either. The noise insulation on this vehicle is outstanding. It is remarkably quiet inside the vehicle. Even from well into the saloon it was possible to have a conversation with someone sitting many rows away at normal voice level. EVM set out to produce a vehicle which was a little bit different and which operators could adopt as their fleet flagship. In my view they have achieved that by the bucket load. This is a very, very attractive small coach. For information on the EVM Grand Tourer contact Danny McGee or Peter Flynn on 0845 5205160; e-mail to: [email protected] or check out their website.